Description: Artie is a little Wolkhar boy growing up in the Human village of Windagill Valley with his mother, Judi, and his grandfather, David. And even though they live in a Human village, they still have to honour Wolkhar tradition. In Artie’s case, now that he has reached his 10th year, he must undertake a coming-of-age trial that will be his first step towards manhood. Since Artie longs to be strong like his father or Leo Armstrong, he’s been very excited for this day, and has been heavily practicing and studying for it. Part of the preparations for the trial involve making their own armour, usually in whatever style they want. Artie is not a veyr artistic person, so his armour is very simple in design. And can somehow squeeze his entire afro in it, fitting it like a glove. Adorned on his head is a large crimson quill, plucked from a mythical beast called the Questing Quetzal by his father long ago. To even see the creature is a rare occurrence, so acquiring one of its feathers is a true accomplishment. And apparently, his father wanted to give it to Artie once he’s passed his test as a reward. But David believes Artie’s responsible enough to look after it, and gave it to him before the trial. Whenever Artie has fond memories of his Dad, he holds the quill close to his heart. He truly treasures it. 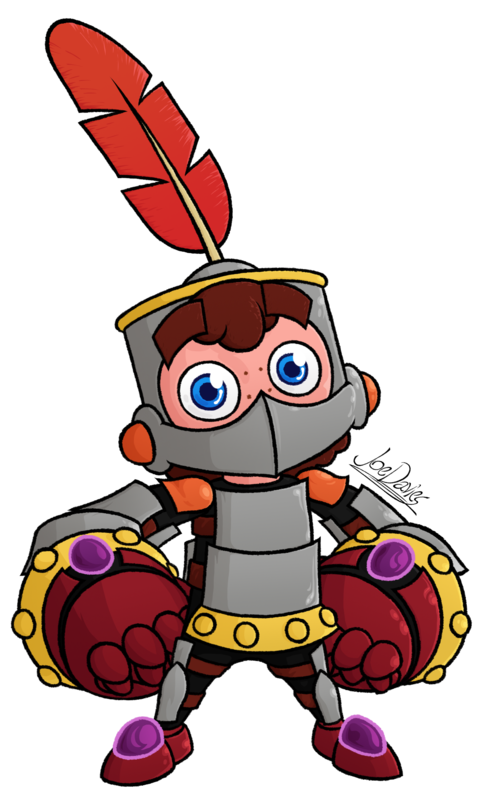 While trapped in the Cave of Rites, Artie comes across a strange broken gem, that he decides to fasten onto his gauntlets to make them look more stylish. After a short while though, he realises the gems have the strange ability to enlarge his hands and feet, and ultimately give him super strength. Naturally such an insane ability leaves him anxious and unconfident to use it for a while, but when he finds his home demolished and a group of shadowy werewolves attacking him, he sees no choice but to use them. Now, on his first big adventure, Artie has to come to grips with his new power; learn to master it, and find out what heroic things he can do with it. Appearance: His design is the same as his unarmoured body, except with a square head instead of a circular one. Simply draw a square around a circle and you got his helmet. His super long quill is his signature; what differentiates him from other knights. His torso, arm and leg armour are each separated into two sections, to make it seem more flexible when he is moving, while also retaining the simplicity of his design. His guantlet designs are similar to fire hydrants, in that they are nicely rounded, with a bumpy wrist cover. Attached in the center of his backhands and on the feet are the purple gems, all the same size with one another. His boots are also longer in size than his feet. Also, and I have to admit, this is a bit of a flub on my part, this is actually the first time I drew him in his armour with his neck showing. And I only noticed it when trying to copy the same pose from his Unarmoured version. I’m not entirely sure yet if it is a feature I shall keep; have it always show in his design. His afro sticking out from underneath the helmet is also not usually visible from the front, but is definitely visible from the side and the back. Again, I’m not sure yet if I should keep this change. – The name of the creature whose feathe Artie wears on his head; the Questing Quetzal, is named after the mythical Questing Beast from Arthurian legend. In that legend, Arthur and his knights are what slain or at least fought the beast. In this universe, it’s Artie’s father whom has battled it. That way, it represents the stride Artie wants to aim for to become a hero like his Dad. – I foolishly deisgned his armour with no gaps ro sections in his design; making it look like a very stiff suit, or at least a very rubbery one when Artie moves. I made a plot point in Chapter 2 about how Artie went from that design to this one, in order to pass time, waiting for someone to rescue him. I have to admit, the need for a design change came at a perfect opportunity when writing that story. – The first time I designed his armour, I made it mix with the flesh around his eyes to emote expressively in a very cartoonish way. That is why in Artie’s initial designs, the white of his eyes was not present. Of course that design point has changed since then into this, where the armour doesn’t add to Artie’s expressions, and h now has huge square-ish eyebrows to show his emotions. – The quill of his design has become my trademark. I use for my logo, my username, and eventually the name of my site.